NAADAC invites you to join the family of exhibitors, sponsors, and advertisers at its 2018 Annual Conference: Shoot for the Stars, October 5-9, 2018 at the The Westin Galleria Houston in Houston, TX. Exhibit dates are October 5-7. 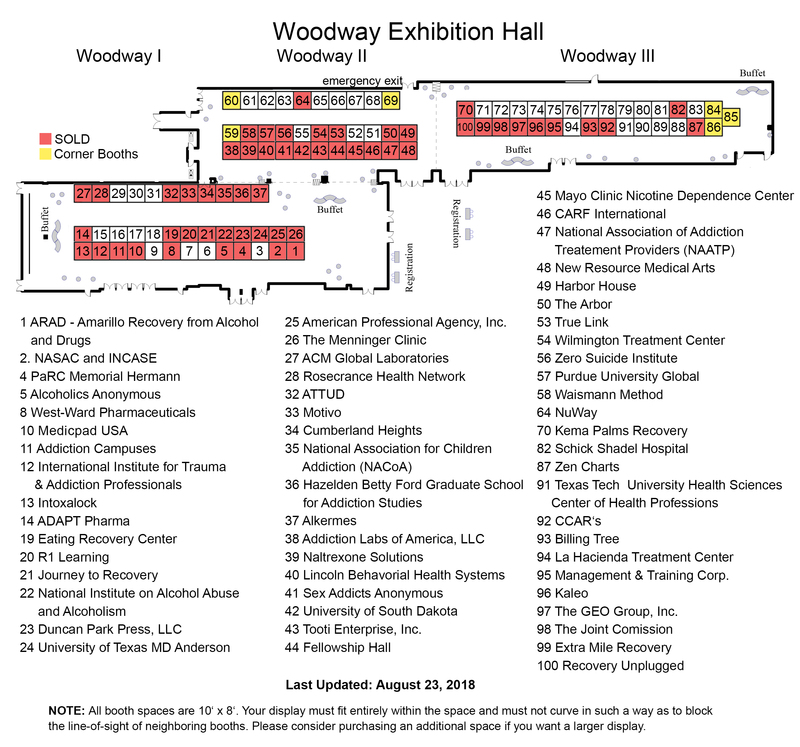 Join over 1,000 addiction-focused professionals for five days of presentations, professional development, networking, exhibits, culture, and community. Deliver both traditional and innovative promotions of your products and services through a custom sponsorship opportunity, an exhibit hall booth, and/or an advertisement in our conference program. Access not only NAADAC’s conference attendees, but also to its prestigious membership of over 10,000, mailing list of over 48,000, and website with over 220,000 monthly visits. Don't miss the change to showcase your institution, product, or organization at this important event! Please contact NAADAC’s Director of Communications, Jessica Gleason, JD, at jgleason@naadac.org or 703.741.7686 x130 to learn more. Maximinze your exposure to conference attendees by investing in the Exhibitor Exposure Package! This includes one inline exhibit booth ( worth $1,500), one single-sheet Attendee Tote Bag Collateral Material Insert (worth $2000), and one half-page, black and white ad in the onsite conference program (worth $900). The 2018 Annual Conference Exhibit Hall at the Westin Galleria Houston will be open on Ocotber 5-7 and will house 100 booths. Exhibit booth rentals are 10' x 8’ in size. Special requests for other sizes will be accommodated if possible. All exhibitors receive two full conference registration badges and inclusion in our onsite program. Please download the 2018 Prospectus for more information. 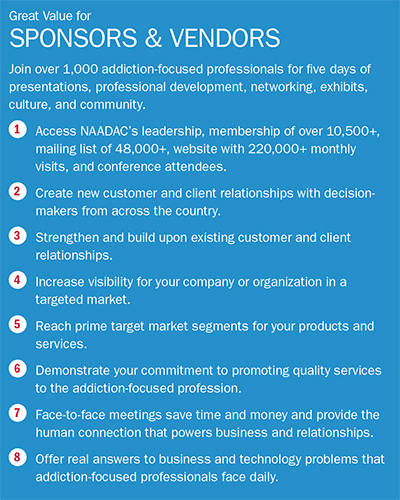 NAADAC offers sponsors a unique opportunity for visibility and contact with attendees at the 2018 Annual Conference. Being a sponsor earns value added benefits for your company. Advertise in NAADAC's onsite conference program & be seen by all attendees!